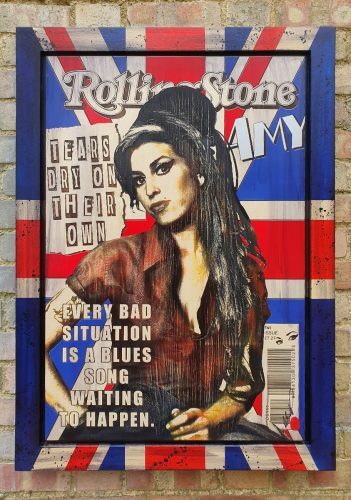 Amy Winehouse Original Variation by Rob Bishop. This piece of art is etched on maple wood. Rob Bishop is a Hertfordshire/Essex based mixed media artist who studied graphic design at college and model making at University. Rob Bishop just loves wood. For several years he has worked as a cabinet maker and by combining all his skills he has developed a unique style of artwork that has caught public attention. Rob uses a mixed media approach to his work which combines digital art, wood work and painting. He will digitally manipulate an image, etches it onto a 12mm maple veneered board then hand paints the piece by using many layers of wood stains, spray paints and lacquer. When satisfied with the image a final layer of lacquer is applied followed by a hand polished finish to produce originals or a series of original variations and finishes with a hand made frame. He produces either a large one-off original or a series of 10 or 45 whereby each image is hand finished and coloured to ensure uniqueness in every piece. Both the artwork and frame are finished with a thumbprint signature. No two pieces can ever be the same each therefore are truly original. Amy Jade Winehouse (14 September 1983 – 23 July 2011) was an English singer and songwriter. She was known for her deep, expressive contralto vocals and her eclectic mix of musical genres, including soul (sometimes labelled as blue-eyed soul and neo soul), rhythm and blues, and jazz. Winehouse’s debut album, Frank (2003), was a critical success in the UK and was nominated for the Mercury Prize. Her follow-up album, Back to Black (2006), led to five 2008 Grammy Awards, tying the then record for the most wins by a female artist in a single night, and made her the first British woman to win five Grammys, including three of the General Field “Big Four” Grammy Awards: Best New Artist, Record of the Year and Song of the Year. Winehouse won three Ivor Novello Awards from the British Academy of Songwriters, Composers, and Authors: in 2004, Best Contemporary Song for “Stronger Than Me”; in 2007, Best Contemporary Song again, this time for “Rehab”; and in 2008, Best Song Musically and Lyrically for “Love Is a Losing Game.” She also won the 2007 Brit Award for Best British Female Artist, having been nominated for Best British Album, with Back to Black.